Can Real Estate Investors Still Get Financing? If you're head is still spinning from the recent changes in the lending marketplace, and you're wondering how the heck you can finance your investments with the lending industry running scared from anyone but the best buyers, you won't want to miss out on "Can Real Estate Investor’s Still Get Financing? " Banks are even tougher these days with who they're lending to, and they're looking more and more at your credit. What if you have less than perfect credit, don't know how to best present your deal to the bank, want to get commercial financing, would like a line of credit for your business and investments, or are confused by the new FHA loan requirements and how you can use them to your advantage? 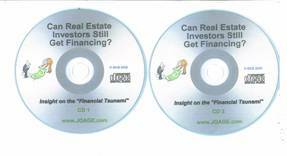 With theses 2 jam packed informational CDs you will never have to worry about getting or controlling a property again.